Meet Simanta V. Mahanta, our September 2018 #DryTortugas Photo Contest winner. We had the chance to ask him a few questions about his experience at the Dry Tortugas National Park. Read on to learn how he captured his amazing photo! I visited Dry Tortugas on August 4th this year. This was my second visit but first for my group of friends. I arrived by the Yankee Freedom. It was excellent! The weather was lovely. I must acknowledge how amazing Hollywood was! We all respected the amount of work he put in to make our excursion comfortable, safe, and enjoyable! He's truly a man of many skills. To me, the essence of Dry Tortugas is the aesthetic contrast of the fort's inner corridors with its windows that look out to the gulf! This is exactly what I wanted to capture in a photograph. The dynamic range was captured using bracketing. I used my Nikon D810 and the wideangle 14-24mm was essential to get this frame. We were celebrating a birthday and the perfect weather and turquoise waters made it absolutely memorable! The birthday boy had recently learned how to swim. Snorkeling in the open waters made it truly special for him! 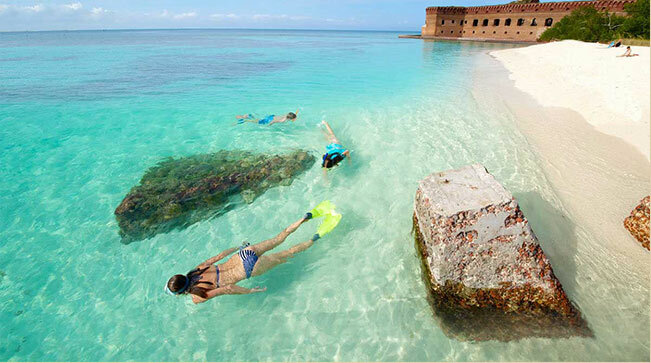 And yes, Hollywood - a trip to Dry Tortugas without his ever upbeat attitude wouldn't be complete! I'm on a quest to explore all 60 National Parks. I've done 46. The National Parks pass will be instrumental in achieving my goal! The next parks I am visiting are Mammoth Cave and Smokies this winter.